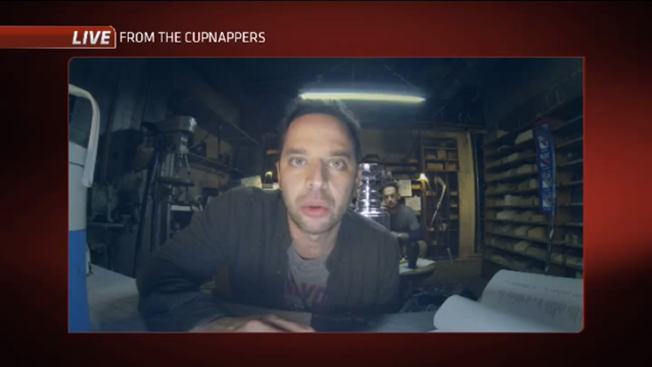 Nick Kroll really wants to play in the NHL—so badly, he'll steal the Stanley Cup and hold it hostage. At least, that's the premise of this long-form ad for NBC Sports' coverage of the hockey league as the playoffs approach. Kroll and his henchmen get up to predictably idiotic but entertaining antics. That includes, naturally, eating out of the trophy—first salad and then fondue. Kudos to them for keeping the meal balanced. The ad was created by the Brooklyn Brothers, which is carving out a specialty of pairing comedians with sports leagues—it also turned Jason Sudeikis into a soccer coach for the Premier League on NBC last year. The network also airs NHL games, and reportedly recommended the agency for the hockey work. NBC's own talent also makes cameos in the ad, including Jim Cramer—the perfect choice for a spot that shouldn't be taken seriously.